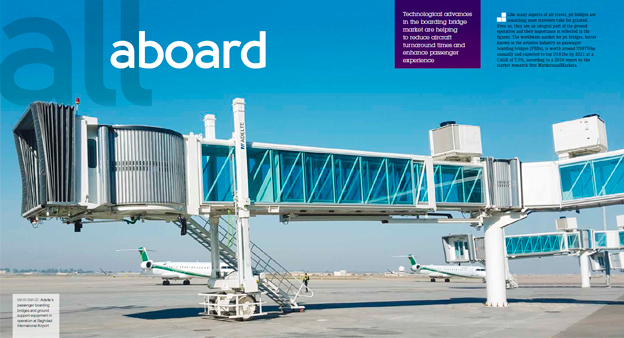 Barcelona, 27th February 2015 – ADELTE has accomplished the installation of two Apron Drive passenger boarding bridges contracted by La Réunion’s Roland Garros Airport to provide commercial aircrafts, including the A380, and their passengers the best docking and boarding service. After supplying the electromechanical and glass-sided Passenger Boarding Bridges equipped with ADELTE’s new A/C Rooftops and hurricane tie-down systems, ADELTE has won a new contract for the upgrade and refurbishment of the existing other six PBBs. All electrical components, PLC, control console, flooring and glass panels will be changed, six A/C Rooftops will be installed and the Passenger Boarding Bridges will receive a specific anti-corrosion processing and high quality painting.